How is Google’s mobile revenue rising if 50% of people do zero searches per day? Ooh look, an ad on a mobile search. Photo by patientpowerful on Flickr. If, on average, people do less than one search per day on mobile, then how is it that Google keeps reporting that mobile search is bringing in more money? Isn’t that a refutation of what I said last October, when I said that it was a “growing problem” that 50% of people do zero searches per day on mobile? 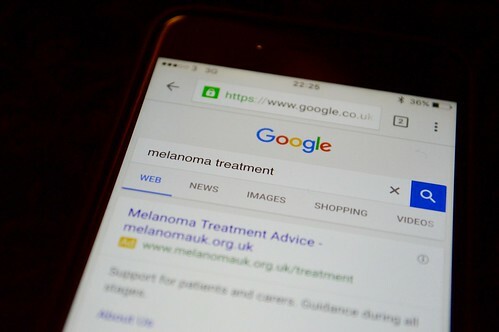 Wall Street analysts are interested in this question, because they can see which way the wind’s blowing – towards mobile, away from desktop, where searches in developed countries are likely tailing away in total number. (They certainly are in the US.) If mobile is growing, and fewer people do searches, and Google depends on searches.. isn’t that bad? But Google says everything’s rosy. Until you examine it more closely. “we also benefited from solid growth in desktop and tablet search as well as continued strength in YouTube and programmatic advertising.” Porat also says later (in the Q+A); “mobile search revenue was up considerably”. So everything’s great. Although Wall St sold off the shares, on the basis that mobile ads weren’t converting well. Huh? Wall St has it wrong, surely? So how is mobile search bringing in more money? Simple: Google has stuffed more ads into view. On mobile search, you now have to scroll the page before you see an organic search result. This is a crucial question. What Post is asking is: do people actually do more searching on mobile? And is the number who do searches growing? (They’re precisely the questions I’d ask if I were on the call, so 👏 to Post.) Will Pichai, the search engine’s boss, answer this? No, it’s Ruth Porat stepping up to the mic. The pattern keeps being repeated. Analysts try to ask questions to winkle some sort of insight into where mobile search is going; Porat and Pichai duck and dive. Here, Nowak is first asking about the ad changes on mobile which added another ad. On the desktop, he’s asking another deeply relevant question. Desktop search is slowing down in developing markets, because people spend less time on desktops, more on smartphones. So earlier this year, Google changed the layout of its desktop results so that there’s no “right-hand rail” of adverts. Instead, all the adverts are piled at the top of the page, followed by the “OneBox” promoting Google services (such as Maps, YouTube, and News). For “highly commercial” queries (a definition Google isn’t sharing), you’ll get four rather than three ads on top of the results. And who knows, over time perhaps more and more queries that qualify for ads will be defined as “highly commercial”? So what happens? Is it possible that people impatiently click on an ad when they see something that looks like an answer? Nowak might be implying that it’s simply this which has driven up desktop revenue; analysts aren’t stupid. At this point one has to raise a hand. First, Google wouldn’t have made that change if it meant fewer clicks on ads. But how – how? – can having more ads piled on top of the organic results be an “improved user experience”? If the ads are better for the user than the organic results, then why have organic results at all? (Nowak seems to be hinting at this too. All ads would mean Google would absolutely coin it.) If the change means you have to scroll further to get to unpaid results, how is that better? I really don’t get it. • happily, this improved user experience also results in improved revenues for Google. Me – well, I’m still fascinated by where this will end up. Can Google just keep adding ads above the results without end, as Morgan Stanley’s Nowak possibly implied, and keep pumping up the revenues from desktop and mobile? If so, how does that square with Google’s long-ago disdain for search engines which put adverts ahead of organic results? Since it is very difficult even for experts to evaluate search engines, search engine bias is particularly insidious. A good example was OpenText, which was reported to be selling companies the right to be listed at the top of the search results for particular queries [Marchiori 97].… In general, it could be argued from the consumer point of view that the better the search engine is, the fewer advertisements will be needed for the consumer to find what they want. Those words are nearly 20 years old. But they’re still true. This entry was posted in analysis by charlesarthur. Bookmark the permalink. So what does this mean? Will there be a new search engine that shows fewer adds, which eventually becomes more popular than Google as it gives a better user experience? Displacement is unlikely. Google is deeply embedded in search. What’s more likely is just that explicit search becomes less common and so the ad effort grows. There will probably be a peak – but how far off is really impossible to know.